My cousin Charlotte Mearman died due to injuries from the fire at this circus. My Aunt Edith (Charlotte's Mom) called my Mom to see if she wanted any of my sisters to go, but my Mom (Elsie Mearman) said no, she wanted her girls to be at home. When she got the call of what happened we were all very upset. I was only 6, so most of my memories are from my older sisters, as they told this story. I know after this terrible fire nothing was the same at my Aunt and Uncle's home. Eventually they had another daughter but nothing could take away the loss. ...grandfather tossed each of us to the ground and my father caught us. 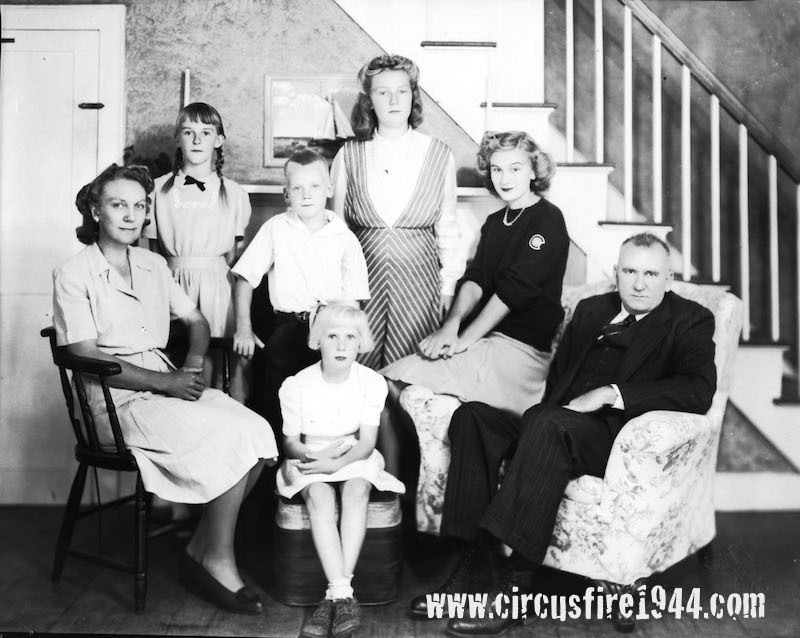 I was 4, going on 5, and was at the circus with my father Joseph Middleton, my grandfather Edson Ramsdell, my brother Edson John Middleton and my sister Maryellen Middleton. We attended as a family group and walked there from the old Blue Hills Project. I recall seeing the fire from inside the tent in the bleachers as the high wire act was in progress. We escaped from the bleachers where our grandfather tossed each of us to the ground and my father caught us. We exited the tent by the animal cage run. I will never forget the event. ...was sick that day and unable to take us. There was a girl in my third grade class that had gone to the circus, and her aunt died from injuries in the fire. She had scars on her arms, and during the school year whenever a fire alarm could be heard outside of the school, she would run home. I think she was afraid her house was on fire. She sat next to me in our 3rd grade class. 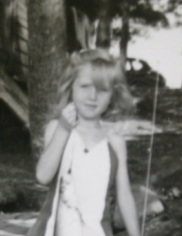 I was 8 years old at the time, and my sister Carolyn and I were supposed to go to the circus with my grandmother, but she was sick that day and unable to take us. Had we gone, she would have had difficulty getting out as she had arthritis and couldn't walk very fast. I know quite a few people, including my husband, who were planning on going to the circus that day, but for one reason or another, their plans were changed. I did not go to the circus that week, nor that day. My sister was home on her first leave (Army) and we had gone to a matinee movie. As we were walking home we began to hear fire and police sirens and thought that it must be a big building fire. Several of my neighborhood pals had gone to the Barbour Street grounds to sneak into the circus - there was always a way for us. Fortunately none of them were seriously hurt, a couple of broken ankles from having leaped off the back of the bleachers to the ground below. Later that day I was called to duty with the State Guard (I was a sergeant) to help the State Police control traffic and the crowds that began to show up at the Armory to look for their loved ones. The smell of burned flesh from the bodies that were laid out on the drill shed floor permeated everything in the area - it was awful. Less than a year later on Okinawa the same smell was evident with the Japanese troops that were scorched by flame thrower weapons and I immediately thought of the circus fire. One never forgets that smell. I never went to the circus grounds that year, nor have I gone in the 63 years since. I was in the tent on July 6 when it caught fire, sitting on the bleachers. The fire shot up behind me - later accounts say that someone flicked a lit cigarette or tossed it at the tent which was waterproofed with kerosene. The first fire that I saw was a long flame coming up from the bottom of the tent and shooting to the top of the tent, and as an innocent child I thought it was "the fire-eater." Sitting near us were a group of soldiers, some in wheel chairs that blocked the aisles. I later learned that the soldiers had their knives around their uniform belts and were able to cut through the burning canvas and let the people out. The entrance very close to where we were sitting was blocked by the cages for the animals, so to get out we jumped down the bleachers and ran straight to the other exit. My vivid memory is the very very long walk to the other end of the tent to get out and away from the fire. I was badly burned but not taken to Hartford Hospital for four days. Then I was in a large wing of the hospital run by the Army doctors - so that we could be given penicillin for the infections. It had not yet been released for use by civilians. I am still haunted by the fire. My memories of the 6th are those of a four and a half year old, some indelible, others from hearing various recollections of the events from others. There are a number of people involved, so I'll identify them first. Paul Mason de la Vergne my father, Beth my mother and myself. Dr. Lawrence "Tommy" Thompson, his wife Marion and six year old son Jack. Both men were staff physicians at Undercliff Sanatorium where we all lived. My recollection has always been that we got our tickets at the last moment. Jack and I had hoped to go, but our parents were unable to get any. On the morning of the 6th we somehow got tickets. The Thompson's were the ones who got the five tickets. Beth had been quite ill after the birth of my brother in January. Marion suggested that Beth take the ticket and she would take care of the baby for the day. About 10 years ago I was at an event back in Meriden and a school mate and I started talking about the fire. She mentioned that her uncle had five tickets and she was going to go with him, but someone got sick and they gave the tickets away. The uncle Dr. James Walsh, a local dentist, was best friends with the Thompsons. I am reasonably sure that is where the tickets came from. The events of Beth moving her seat are well documented. Someone went to an usher and explained her fear of heights, and he came up and took her to another seat. When she got to the seat she stood and waved to us. We were in the back row of the bleachers and near the ropes that held up the tent. When the fire started one of the adults slid down the ropes and the other dropped Jack and I into his arms, then the other slid down the rope. We ran through all the circus exhibits and to the street. Apparently the first thing the men did was try to contact someone in Meriden to pick Jack and I up so the men could look for Beth. After some time they found a family with a phone that they would let us use. Dr. Cole Gibson, the superintendent at Undercliff, came and picked Jack and I up and took us home. The men stayed until my mother was identified, and returned home late in the night or early morning. They identified Beth by her wedding ring, which I have and my wife wears occasionally. The Armory was the morgue and survivors were accompanied by a state police officer. In this case it was John Doyle of Meriden, later a Lieutenant and head of the departments' polygraph unit. His daughter and I have been close friends since high school. It was not until Lt. Doyle and I met at the commemoration in 1994 that I learned he had been the accompanying officer. I cannot recall our families ever discussing it. We didn't have grief counselors in those days and the war was at its peak - I guess we were just expected to tough it out. Certainly changed my life. On that fatal day my friends & I were riding our bikes from Albany Avenue to attend the circus. When we arrived it had already burnt to the ground and I thought every fire engine and ambulance was there. We saw several burnt bodies, but didn’t realize until later they were once human beings. On that day my wife to be Rose Pantano (I didn’t know her at the time) was there in the fire with her girlfriend Rose Maimore (they were about 14 at the time) and her neighbors young son (I guess he was about 10 years of age.). His name was Julius Baggish I believe. Before the fire had begun the cages full of animals had entered from their entrance way strung out throughout the center of the ring extending to the other entranceway as told to me by my wife. The fire broke and spread very rapidly over the dried out canvas covering the arena. Most people ran to try and cross over the cages, but there was mass hysteria and I guess the bodies just piled up. They escaped by sliding down to the back of the seats exiting under the tied down canvas only to witness the terrible screaming of the people inside. They stayed to witness many of the burnt bodies and then fled home to tell their parents who knew they were there at the time. To the day my wife died in 1997, she never again attended any circus event. I had to take my children to all those events alone and she made sure it was not taken place in a tent of any kind. Along with her girlfriend this was their story. The young boy was Donald Baggish. He turned 12 years old on July 12, 1944, 6 days after the fire. Julius was his father’s name. Donald lives today in Delray, Florida. Donald attended that day with his friend, Charles Nelson Reilly. I attended the circus with two of my sisters and three of our neighbor's boys. We all survived but not without permanent issues. I have fear of some tents even today, and have serious claustrophobia, but otherwise I have made it to my 75th year quite successfully. We attended the circus with our neighbor's mother and my mother. As gas was rationed, a purchase by our neighbor's mom of a car which came with a tank gas, helped defray that problem. I remember clearly standing behind her as she drove us to Hartford. I had an extreme headache, probably a migraine but perhaps it was a premonition of things to come that afternoon. The circus had been progressing for about 20 minutes I believe, when my sister Cora May called out "OH LOOK!" and pointed to the far end of the tent where we had come in a short time before. There was bright orange color rising up from the ground to the left of the entrance. I didn't know what it was but my mother did and put her arms out abruptly in front of my sisters and me to keep us from running and told us to drop to the ground from the bleachers we were sitting in. It was a relatively short drop, and then she gathered us together and led us to the side of the tent. One of my sisters had apparently become overpowered by the scene and had to be abruptly brought to reality to get her to jump down with the rest of us. A boy had just come by and had cut a vertical slit in the tent and we scrambled through the slit and out of the tent and up a bank away from the tent. There was a horrible roar coming from the scene. The next thing I remember is waiting at the G. Fox and Company parking lot while the neighbor's dad and my dad attempted to find two of the boys who had run out on their own. The dads were work at UConn as both were professors and hadn't attended the circus. A call to our home phone at Mansfield Four Corners was answered by one of the men who worked at Pete Sabin's General Store at Four Corners, and who knew we were away. The phones were on a party line with distinctive rings, ours was three rings. He was able to get word to the dads who came as fast as possible to Hartford, from about 25 miles away. The two boys were found but not before a long and terrifying task for my dad and their dad in going into the temporary morgue on a fruitless quest looking for them. I remember constant sirens coming and going on the streets and a general feeling of dread permeating the city. There were families in my community of Storrs/Mansfield who lost several members to the fire and the subsequent stampede. Reserved seats were a curse as there was no way to quickly exit the seats, unlike dropping down from the bleachers. In subsequent years I have only encountered one person who had experience with the fire, and that is of a family who came from Boston whose dad had been at the fire. I have read that there was an individual who claimed having set the fire. I remember my dad disputing the theory at the time that a cigarette in the saw dust could have caused the rapid conflagration which ensued. Apparently the matter of possible arson was not pursued and I believe that the person has died. Today, I still have vivid visions of the scenes when the fire started, and of some pictures of the aftermath of the fire, with the circus band's bass drum's frame remaining after the fire overtook the band. I can see the smoke rising from the scene, the orange flames, and a picture of one of the clowns taken afterwards with tears in his eyes. My tent phobia pertains only to tall entry ways of large tents, like the one I encountered several years ago in Flagstaff at the annual crafts show. I came to the entrance of the tent and literally could not enter the tent. I had a flashback apparently of the tent at the circus fire. I was 4 when the circus fire happened and was carried out on the shoulders of an Uncle and I remember to this day the screams, pushing, shoving and all the fire hoses squirting water into the air. I was taken to the hospital, but only to be held up outside so my mother could see me as she had just given birth to my brother. I believe at the time we were living on Willys St. in East Hartford CT. The people I was with was a Aunt and Uncle whom I really do not remember as I have only seen a photo of them. I still dislike crowds and it took years before I fully understood that anxiety. My mother used to tell me the story of how she was in a terrible fire at a circus when she was young. She's passed away some 30 years ago now, and I hadn't thought of that story since years before her passing. She would have been 10 at the time of the fire. Born October 2, 1933 in Hartford. Her name was Cecile (pronounced suh-seel) DeSoto. I believe she attended with her mother, though I don't know if any of her siblings attended or not. I do know that she escaped without harm, but she was witness to the disaster and mayhem, and it affected her throughout her life. I don't know if it's of any matter, but I thought my memories might be of some interest. I had no idea this event was so significant, or that so many people had been injured or perished. I now understand the gravity of what she was trying to share with me all those years ago. I was so happy to find the photos of William Curlee on your website. William was my grandmother's brother. We have always been so proud of his actions the day of the fire. You may not know that Will and his son, David, initially escaped from the burning tent. Will told his son to go wait for him at the car and went back inside the tent to help. Sadly, he did not return. My grandma, Barbara and my great Aunt Dolly (Mary) attended the 60th anniversary memorial in Hartford, CT. (We live in California) They were quite moved by ceremony. Thank you for posting these wonderful photos. I can't wait to show my grandma. She will be thrilled. I talked to my grandma and she thinks that Doris (William's wife) is on the right and is not sure about the other gal. Grandma thought it might be Dolly. It kind of looks like her, but she wasn't sure. She also said that William was always called William and not Bill. It had always confused me too since he is always referred to as "Bill" in newspaper articles etc. When the book by Stewart O'Nan came out about the fire I bought it for grandma for Christmas. She thought the book was very interesting, but thought it was funny that at the very beginning of the book it says something about William visiting with his mother and my grandma told me he hadn't been to see her yet and she was irritated with him. Typical family drama made worse, of course, by what happened that day. We always wondered where he got that information.